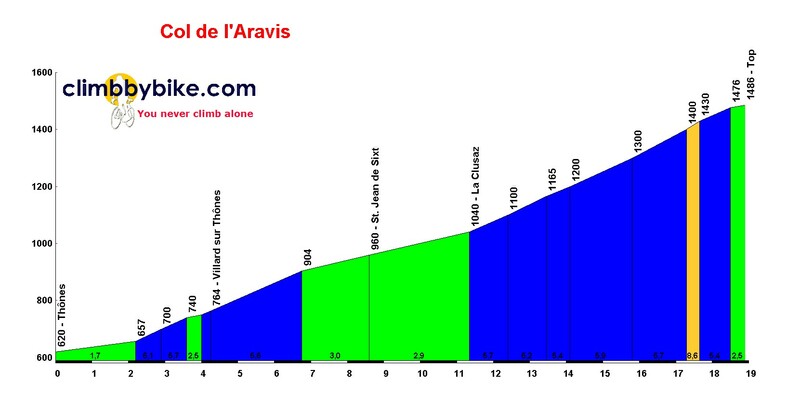 Cycling climbing profile of Col des Aravis from Thones. Cycling climbing profile of Col des Aravis from Thones. Col des Aravis, at an altitude of 1486m, is in the Aravis region of the Northern Alps. It links the village of La Clusaz to the north-west with the village of Flumet in the Vallee d’Arly to the south-east. The climb to the col from the market town of Thones is less steep than when tackled from the other side. The road ascends up through the valley to the village of Saint Jean de Sixt and on to the picturesque ski village of La Clusaz. Beyond La Clusaz the road gains height through a series of long switchbacks through Alpine pastures before arriving at the col and its magnificent views over the Mont Blanc range. The Tour de France has crossed the col no fewer than 39 times, and the 2016 Tour climbs the col for the 40th time in its history.